Slowly, the term during which baby grew up in the belly ends. 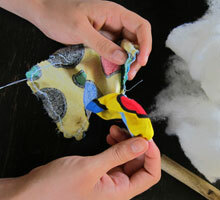 Sew his/her first toy with your hands - a simple cloth teddy bear, who will accompany his/her childhood. You might think that this bear can not impress any child. You will be pleasantly surprised and you will later find out that from the flood of toys that your child will be surrounded is teddy bear, who was sewed by mammy, his/her favorite companion. 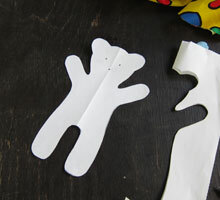 Fold the paper in half lengthwise, folded side will be a center of a teddy bear. Draw half of the teddy with the pencil. Therefore, we have half of the head with ear, half of the body with one lower and one upper paw on paper. Teddy may be of any size, but the best is about 25 cm long. Length of the head is about 6 cm, upper paw 6cm and lower paw 7-8 cm. 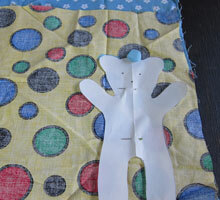 Spread the teddy and get a pattern that is symmetrical on both sides. Margins of upper paws are about 16 cm, lower are 10 cm. The waist is about 8 cm. Lower paws should be slightly wider than the upper. Put two differently colored cloth together with right side. 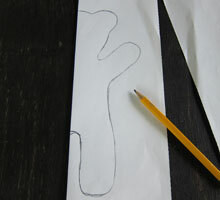 Two pins to handle the paper pattern and trace the teddy with chalk. Cut out about 0.5 cm from the drawn line on the outer circumference of teddy. 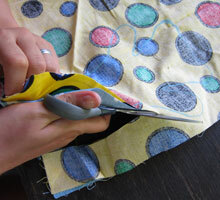 Stitch linearly, so that we keep an approximately 4 cm opening in the bottom of the belly. For greater strength and greater estimated stress when handling teddy by your tots, we recommend to make stronger sewing over the line and repeat it at least twice. 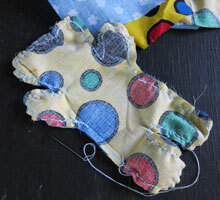 Turn the sewed teddy over prepared opening with your fingers, wooden spoon, scissors... Stretch the ears and feet well. 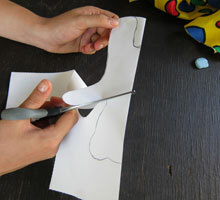 If we find that the thread pulls the cloth in curves, turn teddy on back side and gently cut the cloth in curves. But not entirely to the stitch. And turn again. Stuff the teddy bear with filling. Therefore, we tear the filling as softly as possible. Stuff ears and head. Then upper and lower paws and eventually fill the tummy. Stuff the teddy as you wish. 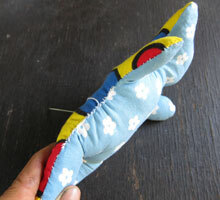 Seal the teddy by sewing the opening together. Sew eyes and mouth with dark thread. Wash the teddy with child clothes in one of the detergents intended for children. As your child will grow, it is likely that it will want to have a teddy withing a reach at all times. During sleep, when walking and while eating. It may happen that you lose it, or forget somewhere or it gets dirty with apple - carrot puree. 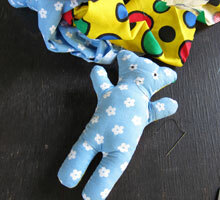 So it's good to sew at least two identical teddies - one substitute. 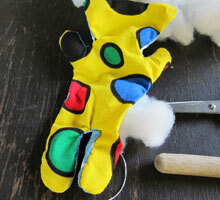 Alternatively, have the pattern and the original cloth in order to sew teddy as needed. They must be identical. If your child really likes teddy, no other will substitute it.